I used to use Nosler bullets as my primary choice for hunting big game, until I went from my furthest distances being in the mid-range area, and jumped into the LR arena. The Accubond has always been a great bullet for 90% of hunters, but with their new LR line, it is a game changer. .561 BC for a 129 grain 6.5 cal and .625 for a 150 grain 270 cal-That is good! .617 BC for the Berger 7mm, 168 grain bullet, whereas the Nosler has a .652 BC for the same caliber and bullet weight. The proof in the pudding is to see if the listed BC's are actually real-world BC's. 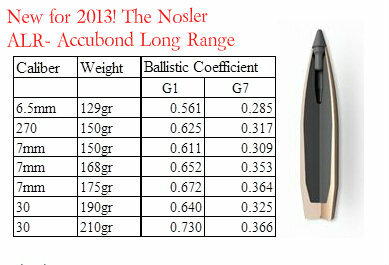 Even if they are being a little overly generous in the BC's, Nosler has done a great thing here. Hate to see the price! I want to try it.....the new Accubond.....see if it does better than the last incarnation. Those and the Fusions didn't blow my skirt up, especially when the most accurate (for me) I've found....were bottom-line C&C winchester power-points and Fail Safes. I've been hunting with partitions for quite a few years and felt that they were a little over priced (but they worked) and I would suspect that these would cost even more. I like it too, Ernie. Not that I'd have any cause to spend the money, I'll never send a bullet far enough to take advantage of it's BC's over the standard Accubonds. What I saw last week made me a believer in Accubonds. These days, Bergers are about the most expensive thing I'm willing to fork out the cash for. I currently have some loads with Accubonds. But, once they are gone, I don't see myself buying more. For what I do, Berger, A-Max, Deepcurl, BTHP Gamekings, and Interloks do what I need done. You don't need the Bergers at your ranges of hunting. 190gr 308 @ 3100 2.6" high at 100 3.03" low at 300. Only 12.5" low at 400 and still carrying over 3000ft-lbs. That is minute of elk from here until you they're just a little tan blip in the naked eye. I have to admit, the .30cal one is kinda cool. That makes me want to reload for the -06. At $1.50 a bullet, not for "plinking"
Have you taken a look at the Hornady Interbond? I've taken a pronghorn and a mule deer with the 139 grainer from my .284, and have no complaints. They're not that expensive, either. At least they weren't when I last bought them. They don't have the high BC of the new Accubonds, but they're not bad, either. I also don't know if I would use them on anything larger than deer. That's just an opinion based on gut feel, though. They may be plenty tough for elk. There are so many good bullets to choose from now, one can get a headache trying to pick out the one what works best. Have not tried the InterBond. Though, I've looked hard at them on occasion. Just haven't hunted much larger game than deer size in the past few years. Have taken a few 300 pound range pigs but a corelok did one in and a Berger did the other. A couple 300-400 pound Aoudad fell to some A-Max bullets. The two above occasions (pigs/aoudad) resulted in none of the bullets exiting. But, the game died, none the less. If elk were on my horizon again, I might consider something else. But, still think the Deepcurl, Interlock, and Berger could handle them in the respective guns. Wow! .625 for a 150 grain .270. The 160 Partitions I load are only .434 (claimed BC), and that's not bad for a .270. There's no doubt that the AccuBond will knock critters down hard, I just wish 1) they were a hair more accurate out of my guns and 2) I saw less meat damage even at moderate speeds. That said, with the BCs as high as they are, I may buy a box out of curiosity. I am impressed also and excited about it. My youngest boy took a couple of boar that were around 300 Pounds at about 200 yards with my 6mm Rem. with a plain old 100 grain Sierra Game King about 17 years ago.They were both DRT Bang Flop kills. I killed a big sow back in late April with an 8mmx57 150 grain Hornady Interlock. Those aren't fancy bullets but they do the job and for a lot less money per shot. The point of this thread and these bullets is not about whether or not other bullets perform on game well, and at a cheaper price to boot. There is no doubt about that. The point is that IF these new AB's have the BC's that they claim or close to it, and if they also perform well at lower impact velocities than typical AB's (something else I have read about them), then they are going to one of the top pick's for Long Range Hunter's. 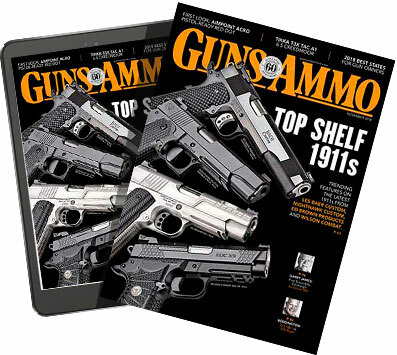 I doubt if short or mid-range (maybe some) hunter's would want to spend the extra money on them, unless they just want to use one of Nosler's cool new products (nothing wrong with that either). Would they give mid-range hunters (500 yards max) an edge in wind? Yes. But it is the ones who typically kill from 500 on out that will really be interested with these. Of they will have to pass accuracy tests and such, but I imagine they will do that well for many custom rigs. I know I will end up getting some in 6.5 and 7mm for sure. Yes, I agree, I have some for my 7mm08 but really don't need them and I am done with them. The 150gr AB new long range is the one I want my hands on for the 7mm08. So, Linefinder should be able to reach out to 150 yards now? Awesome!